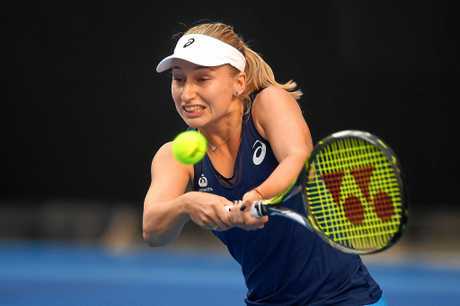 TENNIS: Daria Gavrilova proclaimed after her first round match that she was incapable of winning in under two hours, and she proved true to her word in her Australian Open second-round clash - just. The Australian young gun took the long road to the third round, paving her way with yet another gritty three-set victory, defeating Croatian Ana Konjuh 6-2 1-6 6-4 in two hours and one minute. It all looked to be going smoothly for Gavrilova, before Konjuh - a successful junior player who made the transition to the professional tour as a 16-year-old three years ago - turned up the heat. Konjuh's weaponry - namely her serve - had less of an impact, allowing the 22-year-old now-Melburnian to pounce, mixing up the play with effect. She was forced to adjust, and managed to do just that come the third set, needing just one match point opportunity to close things out. 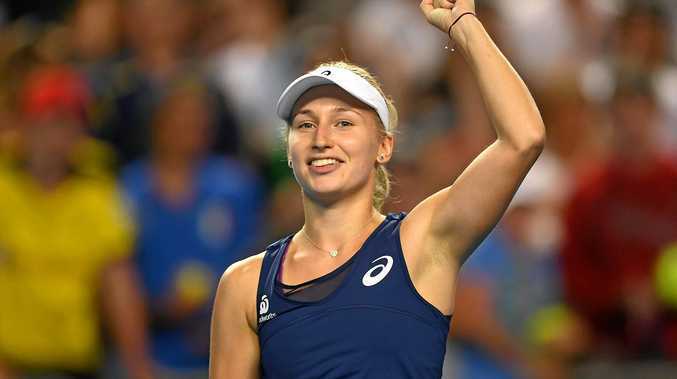 But it wasn't without a spot of drama, with Gavrilova admitting she "lost her cool" when hit with a time violation by the chair umpire for taking 23 seconds - three more than permitted - to take her serve. "I lost my cool a little bit, but it's not easy (to stay level in such an intense match)," she said. "I just knew that I had to do it again to get the win. I'm proud of myself." The local hope had plenty of support on Hisense Arena. "I absolutely love it - it's one of my favourite courts and I always get the best support out here," she said. She might have made the fourth round of last year's tournament ahead of a big 2016, but she's not getting ahead of herself just yet. "I'm not thinking of the future yet, I'm being in the moment," Gavrilova said. "I'm really enjoying my tennis at the moment and just being at home is amazing." Gavrilova will take on Timea Bacsinszky, who just off Danka Kovinic 6-1 7-6 (7-5) just half an hour earlier. Djokovic out of Australian Open: Last year's Champion beaten by world number 117.